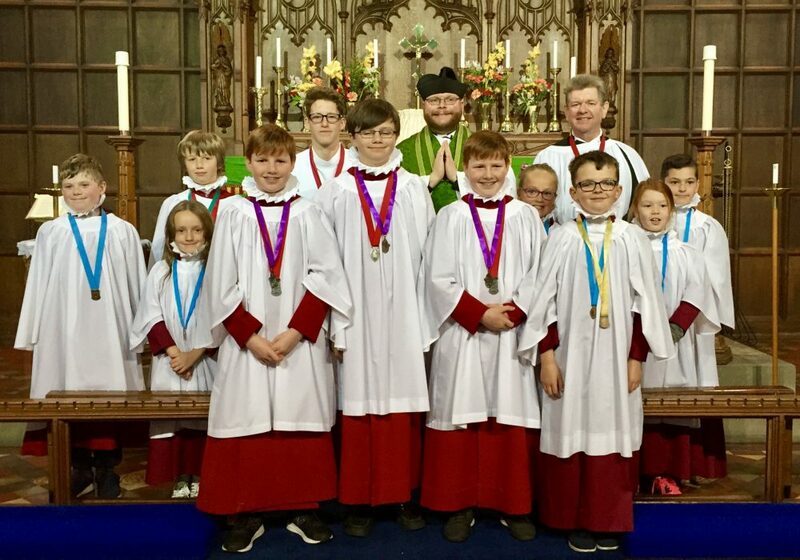 At the Parish Mass on Sunday 17th September 2017 three members of Saint Leonard’s Parish Church Choir were promoted to the rank of Archbishop’s Choristers in the Diocese of York. After successfully passing their examinations Reuban, Samuel and Thomas were promoted to the rank of Archbishop’s Chorister by Father Adam Gaunt, the Rector of Loftus-in-Cleveland. The three choristers will go on to receive their special certificates at the Royal School of Church Music Diocesan Choir’s Festival to be held in Bridlington Priory Church on Saturday 30th September 2017. Also at Mass on Sunday 17th September 2017, Brandon was promoted to become our new “Chorister of the Term”. Toby, our outgoing “Chorister of the Term”, passed on the special medal to Brandon who will now wear the special medal for the forthcoming term.